IT’S VITAL that the ongoing regeneration of Oldham town centre has a strong cultural element – our history demands it and so does our future. As a town we’ve got an enviable tradition of producing and playing host to scores of fantastic actors, comedy, drama, dance, music and pantomime performances and we must ensure that can continue. Arts, culture and heritage all matter and they must be at the heart of the revival of Oldham. These activities give fantastic life opportunities to people of all backgrounds and levels of talent – whether that is by taking part, spectating or benefiting from some of the educational and learning spin-offs. They are also important because modern town centres no longer simply work as a cluster of retail outlets. To be successful they need to be a destination: and one with a wide enough offer to appeal to all kinds of tastes and needs. Lifestyles and shopping habits have changed beyond all recognition so you need a range of attractions that can attract footfall of all kinds and cater for the ‘leisure pound’. That’s why we’ve delivered the ODEON cinema and restaurants at the Old Town Hall, where Gourmet Burger Kitchen opened this week. It’s also why we have worked so hard on our Independent Quarter and our Digital Enterprise Hub – and it’s why we are committed to a phased programme that will bring our new Cultural Quarter together. 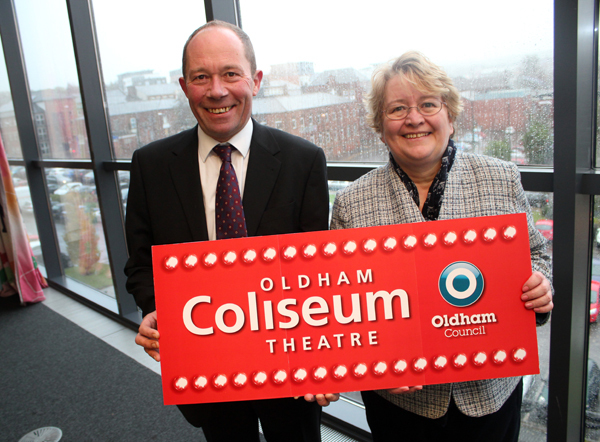 The brilliant news this week that Arts Council England has confirmed a £7.1m grant towards a new Oldham Coliseum Theatre means those plans can now progress from paper to bricks and mortar. The vision is to move the Coliseum into a new building located just yards from the Oldham Central Metrolink stop, and alongside the new Heritage and Arts Centre which will tell the story of our borough’s past through a series of displays, installations, archives and artefacts. Both will also be next to Gallery Oldham, which hosts an excellent range of travelling exhibitions and events, and Oldham Library which boasts some of the highest visitor numbers across the region. Together these assets will create a fantastic new cultural hub for Oldham, strengthening the facilities our residents can enjoy – and our visitor economy. Getting to where we are today with the Coliseum Theatre project has required a great deal of co-operative working and shared vision on all sides. I am proud of the work that has been done on the project and the backing of the Arts Council England shows that we must be doing something right. It is not every day that ACE invests such a significant sum in a theatre in the North of England; let alone one that is not in a city centre. The Coliseum has long been a jewel in our borough’s crown, but it’s also been clear it was not viable to stay at its creaking Fairbottom Street home. I know that some people will think that’s a shame and I understand that. Regular visitors will obviously have a natural affection for the current building that holds so many great memories for them. Places are important to us all, of course, but they are nothing without the people that make the experience special. The quality of a night at the theatre, after all, depends upon both the players and the audience. This new home will still boast that same warm and authentic welcome that people have come to expect, but it will instead be in state-of-the-art facilities – including a 550-seat main auditorium and a 170-seat studio theatre – and will offer a wider programme of activities with greater benefit to our communities and people. The new plans that are due to be submitted next year shouldn’t be seen as a sad break with the past, but simply as the next chapter in the Coliseum’s long-running success story. This is actually the second time in their history that the theatre has moved. They left their first home on Henshaw Street in 1887 to make way for Tommyfield Market..
They’ve been in this business since 1885 now and their timeline is littered with appearances by the likes of Eric Sykes, Charlie Chaplin, Bernard Cribbins, Dame Thora Hird, Anne Kirkbride, Kathy Staff, Claire Sweeney and Kenneth Alan Taylor. We must preserve that legacy for future generations to build the next list of stellar names – and the beauty of the plans is that the Coliseum can continue to run with a full programme at Fairbottom Street right until they move in 2020. There’s a lot of work to do before then but Union Street is going to be a fantastic new venue and the Cultural Quarter a unique asset for Oldham. Next week, as I prepare for the final Full Council meeting of 2016, I will be blogging with an update on progress on our latest budget proposals and the plans at Prince’s Gate.